This is just a quick tip which is actually also given in best of the "getting started" videos from Tableau website. Anyway, I realized just recently how important the function is when building pixel perfect dashboards. To the point: When building dashboards, be sure to think about your ordinance, not only in regards to the numbers you are visualizing, but also what screen size they are looking at. In the perfect world the "Automatic" size would ensure the dashboard was responsive and scaled on a variety of screens, but when I move away from the simple dashboards I find it hard to build consistent dashboards with the "Automatic" option. Elements simply do not move the way I want them to when you change the screen. 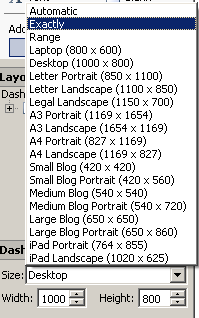 Therefore I often end up using the default Desktop (1000 x 800) size or defining my own width using the "Exactly" option (if you know you are presenting a new dashboard on a 1200 x 1000 screen, why not optimize for that). Furthermore the A4 size works great if you are building a report that will eventually be printed.